It’s Deeper. 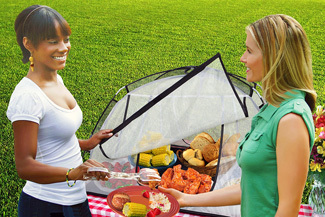 Now you get more room from front to back so you can cover more trays of food in one tent. From Chilled to Grilled. 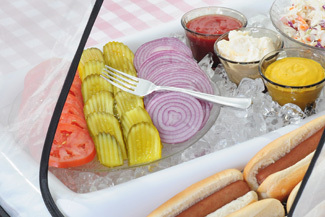 Hot food, cold food, and everything in between all live happily together in one Picnic Pal Plus! Comes with Free Ice Buddy+. You get our Ice Buddy+ inflatable ice tray — absolutely free. Our Low Price Offer! For a limited time, we’ve reduced the price to make it easy for you to buy one, two, or more! PicnicPal+ is the world’s best solution to enjoying food outside. 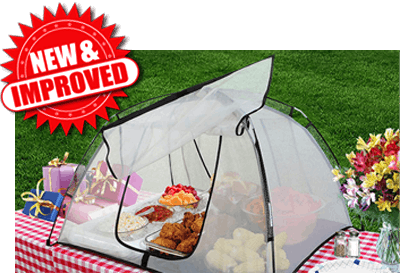 If you love backyard family gatherings and parties, or just love picnics in the park, PicnicPal lets you keep your food protected from bugs, insects, dirt, dust, and wind—safely and reliably. No more need to babysit your food or have to track back and forth to your home or vehicle to resupply your spread. Now go have fun while your family and friends help themselves! Inflate it, position your cold dishes in it, and then pack ice snug around your food. Keeps your perishable foods and beverages nice and ice cold for hours! 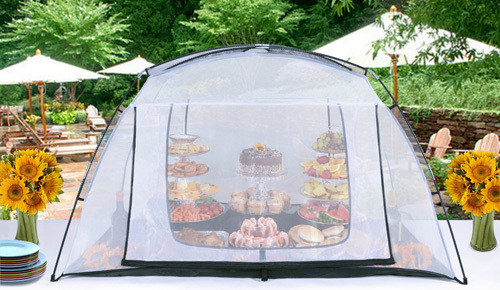 Fully enclosed, tented environment for your food that stays put. 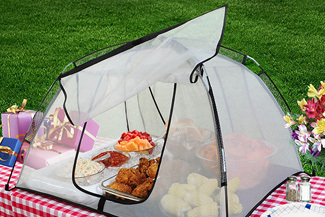 Trust it to protect your food from dirt, flying insects, and other bugs. You don’t have to baby-sit your food anymore! Keep all of your delicious food goods protected from flies, insects, dirt, and dust—and the bacteria that comes with them! Easy drop-down door lets you open and close with one hand. Let your friends help themselves while you relax and have fun too! No zippers. No snagging. Easy closure. Made of proven, durable fiberglass materials that lasts for years. Our PicnicPal products are well-made and work like a charm! If you don’t absolutely love yours, you can return it to us within 60 days of your purchase, along with proof of purchase and explanation of the return, and we’ll give you a full refund. Enjoy your PicnicPal for years to come. 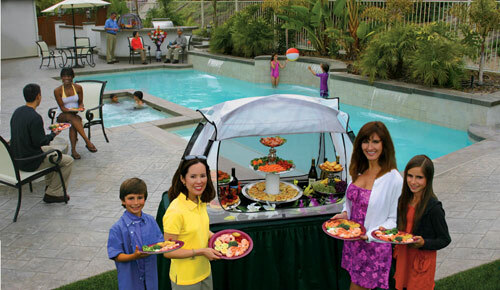 Take your outdoor food experience to new heights of ease and enjoyment! Need to feed a larger crowd? Planning a wedding, graduation,or a large family feast? 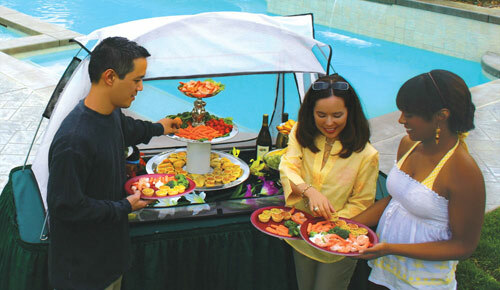 Our PicnicPal XL is EXTRA LARGE to protect all of your delicious catered foods, home cooking, beverages and other goodies for your family and friends. Luv luv luv these!!! We have family night every Monday night and these works wonders…someone doesn’t have to stand and “mind” the food from flies!! The City of Lemoore holds an elegant wine and food tasting every year call Evening Under the Stars. Our County Health Department got involved this year and wanted us to have each vendor put netting on three sides of their tables. We did not want to ruin the elegant look of the tables. I looked online and found PicnicPals. They sit on top of the tables and can be seen through and will protect all food items put inside. We contacted our Health Department and they were accepted in place of netting on three sides of the table. The PicnicPals functioned well. They easily fit the chaffing dishes and the opening in the back was big enough to serve out of. Our Recreation Department also does football and baseball trips. We tailgate before the games and will use the PicnicPals for that purpose also. Next year we are going to decorate the PicnicPals to make them even more attractive. We are very pleased with our purchase. 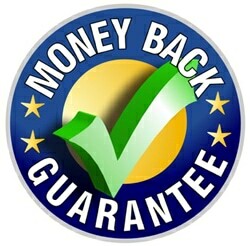 “I just wanted to mention the wonderful great service I have received from Dan. After ordering my product and being lost after delivery and not receiving it in my hands, Dan made sure to call post office to trace package. 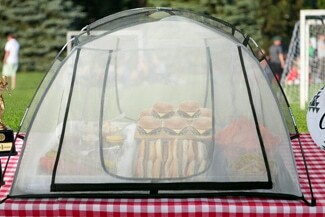 But the most important he made sure that I did have my PicnicPal for my event this weekend by overnighting me one. I truly appreciate all the help you gave me Dan and the Superb service you give. With service like this you will go very far with your customers. My coworkers are interested in seeing it set, so I will be setting up at lunch time. Main reason I bought these is we “live” out by our pool area in summer. Every Sunday is Family Day. I love to grill, but keeping flies off of cooked meats is a full time job. My favorite outdoor dish is usually ribs or Kahlua pork. Yum! Close second are grilled veggies!